Walla Walla, Washington, known for apples and wheat, has also become a compelling wine destination. Ray Isle experiences its top-notch Cabs and Syrahs, homegrown restaurants, and refreshingly down-to-earth spirit. Washington State may be a fairly new wine-producing region, but several of its wineries have generations of history. Here are a few pioneers who put the state's wines on the map with their high-quality bottlings. A blend of Champoux (62%), Sagemoor (26%) and Woodward Canyon (12%) estate vineyards, this wine is aromatically brooding at present, with notes of coffee, toffee and vanilla bean alongside high-toned cherries, dried herbs and flowers. The palate is supremely rich, dense and layered, with milk chocolate, coffee and cherry flavors. Tannins are expertly managed and the wine brings plenty of textural appeal, combining richness and elegance. The barrel notes are primary now, so give them time to integrate. Best from 2025 to 2035. 94 Cellar Selection. We often think of ourselves as California's wine-growing baby brother, but this cab – made with fruit from the 36-year-old Champoux Vineyard – proves we're no longer the new kid in town. Flavors of anise, black cherry and cassis. Drink on your birthday in 2020, and enjoy flavors and scents that have emerged in both you and the wine. Grapes are sourced from Celilo Vineyard in the Columbia Gorge and the winery's estate vineyard, and all are from the cool 2011 vintage. It’s more Burgundian in style than Washington usually produces, showing elegant notes of pear, citrus, and light spices. Understated new oak lets the fruit shine. This chardonnay is an exquisite blend of fruit from Woodward Canyon Estate (71%) and Celilo vineyards. It shows mesmerizing aromatics of corn silk, cream, and spice with a textured, creamy feel and an open finish. Drink while vacationing on the coast, feasting on crab cakes. One of the state’s oldest wineries also happens to create some of Washington’s most ageworthy wines. The latest example is this red blend, near equal parts merlot, cabernet sauvignon and cabernet franc, alonge wit a health dollop of petit verdot. Expect it to be at its best for a full 20 years. Year after year, count on Woodward Canyon to produce chardonnay both nuanced and profound. The 2014 vintage wine is the latest example from this Old Faithful of Washington winemakers. The aromas of this wine are both classic Cab – ripe, lush blackberry, dried herbs – and unique – the aroma of recently rained-on wheatfields. Soft tannins and mouthwatering acid balance this luscious wine, which comes from one of the best vintages Washington has seen and will age well for several years. Good match for beef short ribs. 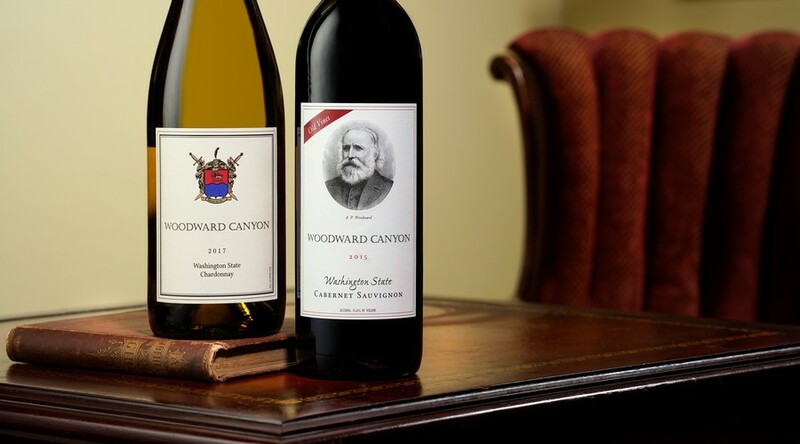 Since its founding in 1981, Woodward Canyon has been responsible for some of the state’s best and most age-worthy wines. Barrel notes of coffee and vanilla take the lead, but with time dense cherry and herb take over. Give it a good 10 years—or several days decanting. This 100 percent varietal wine comes from equal parts Weinbau and Woodward Canyon Estate vineyards. It shows a pleasing interplay of fruit and barrel, with aromas of chocolate, cherry, and spice followed by full-bodied fruit and tightly wound tannins. Positioned in the western part of this dynamic growing region, Celilo Vineyard is known for the nervy acidity of its chardonnays. The site is perfectly captured in this breathtaking bottle that shows richness and vibrancy with notes of apple, peach, and lees.